Fire ants. These mound-creating, stinging crawlers can pose a problem for lawns in the South and Southeast. A lawn care operator and a researcher offer their recommendations for getting these insects under control. Lawn care technicians from Oklahoma to Virginia and southward may encounter fire ants. Within that region, fire ants are one of the few ant species that make a pretty substantial mound above ground, explains Michael Merchant, Ph.D., professor and extension urban entomologist at Texas A&M University. They are reddish brown, do not have spines along the back and have two visible nodes between the thorax and abdomen. Unlike other types of ants, worker ants vary in size. Fire ants are often drawn to warmth, so they can be found along sidewalks and next to electrical transformer boxes on slabs on the ground, Merchant says. He recommends broadcast applications of fire ant bait or insecticide as the best control strategy. Mound-by-mound treatments of fire ants are inefficient and expensive because ants can simply create new mounds a short distance away, according to Merchant. Fast-acting fire ant bait methods may take from one to two days to approximately a week to work. They include products with the active ingredients hydramethylnon or indoxacarb. Slower-acting products include pyriproxyfen or methoprene, and though they may take longer to activate, they can provide season-long coverage. As mentioned, fire ants are attracted to warmth, so electrical equipment, irrigation systems and transformer boxes are especially susceptible to fire ant infestation, and lawn care operators should take care to treat these areas. Granular insecticides are a good option for these areas. Products with active ingredients such as fipronil and bifenthrin treat a thin layer of soil, and as fire ants build their mounds, they come in contact with the insecticide. The product can typically offer a year of protection. “Using these products in a band around a potentially sensitive area, such as a school building, is a good idea,” Merchant says. He recommends using bait products in the turf areas outside the treated zone for additional coverage. 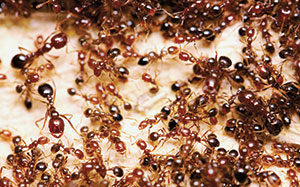 West Bay Landscape’s typical fire ant treatment is a broadcast application of a bait product. “If you’re just doing a little spot here or there, you always have the opportunity for the fire ants to pop in an area that’s not treated,” Alicky says. The company uses a variety of chemical applications, including Award, Extinguish and Amdro on their properties. Alicky explains that though many products have worked well for controlling fire ants in the past, he switches products when it comes down to price of the chemical. West Bay measures the property and quotes a price for spray applications. They typically recommend clients have four applications of an ant bait, administered on a quarterly basis. “If it’s a bad rainy season and if (ant mounds) start coming back up, we go out and we treat the mounds and we do that at no cost to the client,” Alicky explains. West Bay Landscape informs its customers of the fire ant control applications and what to expect, based on the education gained through agriculture and pest management classes. Some of this information can show just how persistent these insects can be. “A single fire ant foraging for food at dusk can actually go 40 to 50 feet away from the mound,” Alicky says. “That’s a long way for a little guy.